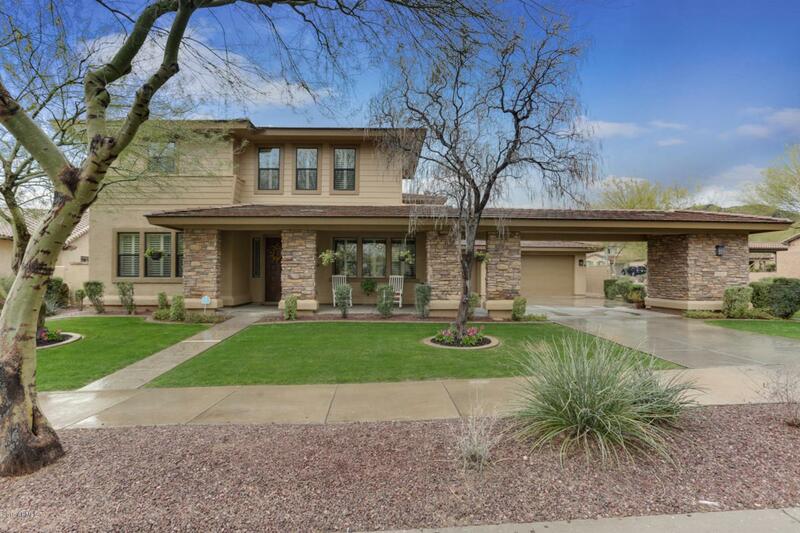 Beautiful and tasteful - this Cachet Home in Verrado's quiet and exclusive 'Vickery Park' neighborhood is surrounded by Verrado Golf Club and sits facing a nice park. The home - from the outside to inside - you will find attention to detail and customization. The large front porch welcomes you, a grand entrance with formal living on one side and spacious downstairs guest suite on the other. A formal fining room opens to a private courtyard with small pergola, perfect for entertainment or morning coffee. As you enter the main space, a very nicely appointed kitchen (stainless app's/granite/white cabinets/5-burner cooktop/custom raised island) opens perfectly to a office/den/studio as well as the double-doors to the backyard and pergola with BBQ/Fireplace/sink/TV and evening lighting.